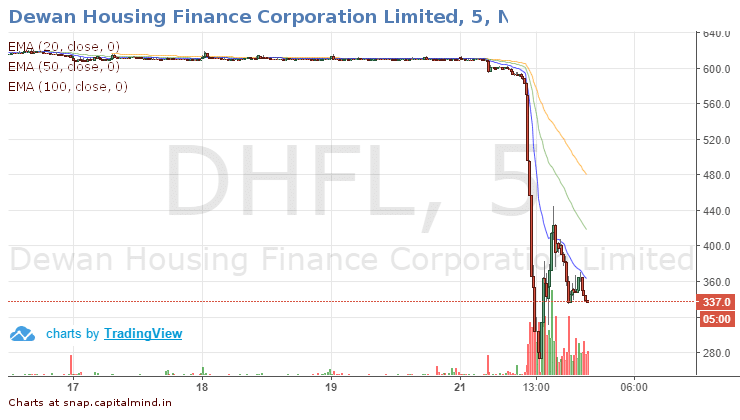 And then, there was the drop in DHFL. We don’t know what triggered it off, but the stock was down 45% by the end of the day. THis is a massive drop – starting 12:36 pm today, it reached levels again that it was at in Jan 2017. This then resulted in some serious selling. 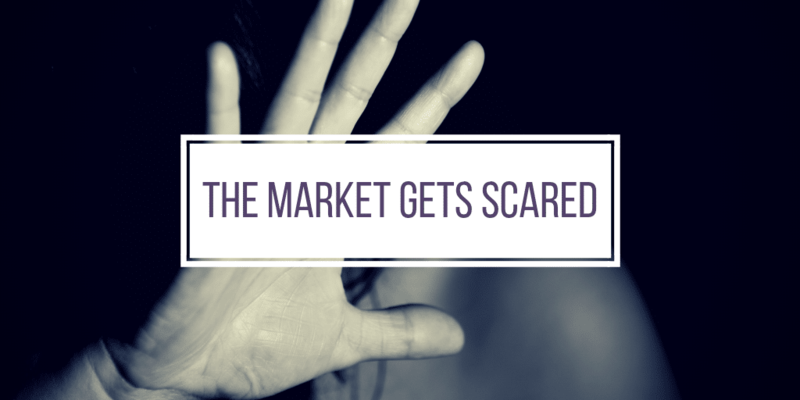 Markets fell across the board and some of them recovered. Most of the smaller companies were in the red, by a serious amount. Indiabulls Housing Finance fell over 13% at a point, and most banks were down more than 5%. Even the market favourite, Bajaj Finance, was down over 7% in the day. The Head Fake: DHFL Bonds Sold By DSP? In a strange twist, it was revealed that oh my goodness, a DSP fund had sold some 200 cr. worth bonds of Dewan Housing Finance Limited (DHFL) at a yield of 11%. This is, first of all, not a very big deal. Because DHFL bonds were trading around 10% anyhow, and if someone wanted to sell at 11% that’s like they want the liquidity. Now DSP’s credit funds have been hit by the IL&FS default, and perhaps to generate cash they’ve had to sell the bond – and while I couldn’t find the 11% yield we saw yields of around 10% to 11% on the bond market data, when it came to DHFL bonds. This is again, nothing of serious concern. Remember, DHFL raised Rs. 12,000 cr. in bonds recently. A single investor selling 200 cr. of bonds is not a significant event in that context. 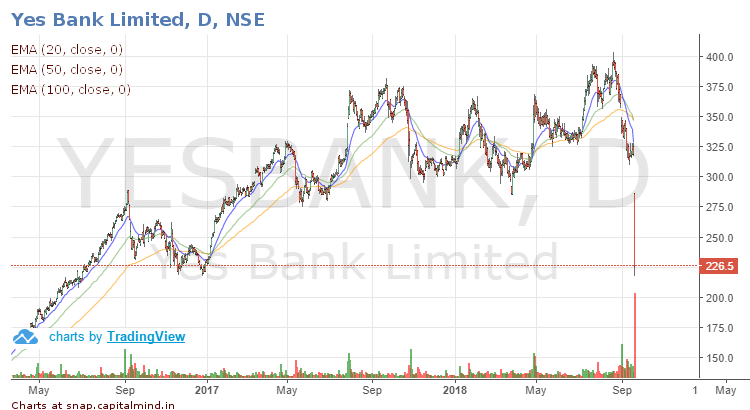 But the rumour kept pushing on – even when the DHFL Chairman came on TV and said that there’s no real liquidity pressure. Nothing seems to have helped – the stock went intraday to 200 and then rocked back down. Possible: Fall Triggered By Cash Needs? The markets are leveraged. And many players end up borrowing and creating tough positions. A need for cash – either because of higher margins (which NSE has imposed anyhow) or because of other sources of borrowing, can result in people “dumping” shares. When you see prices fall with no regard to how much the fall is, that’s indiscrimate or “sell at any cost” kind of trading. This happens in margin calls or cash calls – if your broker asks you for margin on your positions, and you don’t have the cash (this is for futures and options positions, typically) the broker will dump shares in the market and take out whatever he can get. Such massive selling volumes indicate a need for cash, or margins. We don’t know the actual facts yet, but this just seems like it. There were positions for over 3.5 cr. shares in the F&O market. The position limit on futures for DHFL is 3.8 cr shares. A very high level indicates a large number of leveraged players that are in the stock. The higher the leverage, the more likely a “dump” will happen when the leverage goes too high. Some of it cascades. Let’s say you need Rs. 200,000 for one contract of DHFL. If DHFL becomes volatile, then the exchange will demand more – maybe Rs. 250,000 per contract. You may then have to find this money elsewhere, and if you don’t find it, the broker may be forced to sell collateral you have with him. That seems to have spread the contagion elsewhere too – many other stocks fell. All NBFCs fell today. Rumours came around that books are cooked. Or that there’s someone who’s arrested – and that person was actually on TV at the time the rumour was out. And then, that NBFCs will die because oh, the government increased small savings rates. Or that the Commercial Paper Market is dead or frozen. Sometimes rumours like this are enough to freeze the markets. The problem is that no one knows if it’s true or not, so everyone will wait a little. And while they wait, the market’s frozen, because no one wants to act. That one guy who desperately wants to sell is going to keep taking the market down. Financials run up or down on rumours. They have to keep refinancing shorter term debt and they will have to be clear about their own ability to stand if there are such rumours. Otherwise, they can’t roll over short term debt – which for a lender like DHFL, can be quite dangerous since they give long term loans. But in this case, it’s not yet happened. DHFL was able to place a commercial paper issue (at less than 8.5%) and also its bonds sold at decent values in the market. There was no freezing of any market, except perhaps DHFL shares themselves. The fact that the rest of the market fell so much tells us one thing: That we’re surprised by volatility. Such moves should be more common (stocks up or down more than 10%) and shouldn’t cause major panic. It did this time. Why? Because it’s been a few years since we’ve seen panic. And when you don’t see trouble for a long time, you get complacent. So when trouble comes around, your first reaction is not usually the most rational one. Having said that, it’s almost never happened that a stock fell 45% and there wasn’t something majorly wrong. Perhaps we will know later. But what we know is this: Volatility is back. Second note: Is this a buying opportunity? Every fall is, but there’s no point betting the house on a fall. The stuff you like, you want to buy over longer periods of time anyhow, and it’s always good to dip into the markets a little when they make such panicky falls. But your stocks can fall more – so we’d suggest that you keep enough powder in case the market gets worse.